Life Before the Dinosaurs: Olenoides. Olenoides (oh-lin-OY-deez) is a well-known genus of trilobite that lived during the Cambrian Period. Fossils of Olenoides even preserved the antennae and sometimes the cerci (cerci are antennae that are on the posterior end of an arthropod). Some specimens of Olenoides have large bite marks in them, and the predator that did that was probably Anomalocaris. Olenoides probably crawled across the sea floor in search of prey such as priapulids and annelids. It probably had to avoid predators such as Hurdia, Anomalocaris, and Amplectabelua. 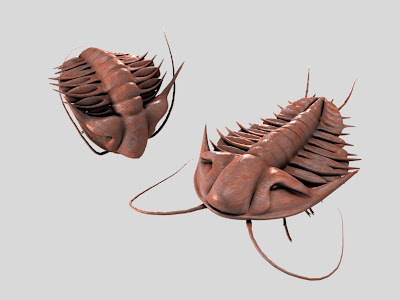 Olenoides was a very plain, regular trilobite, unlike some of its relatives, such as Lonchodomas, Cryptolithus, Walliserops, Psychopyge, and Quadrops. Those trilobites had more peculiar armor. Olenoides has been found in many places, including the Burgess Shale. The largest specimens of Olenoides are about four inches. Olenoides had very long cerci, which could have helped sense danger and prey.